Trafficware leads the traffic industry, building management infrastructure for the next generation of smart cities. The Synchro Studio Suite of products provides the best in traffic analysis, optimization, and simulation applications. 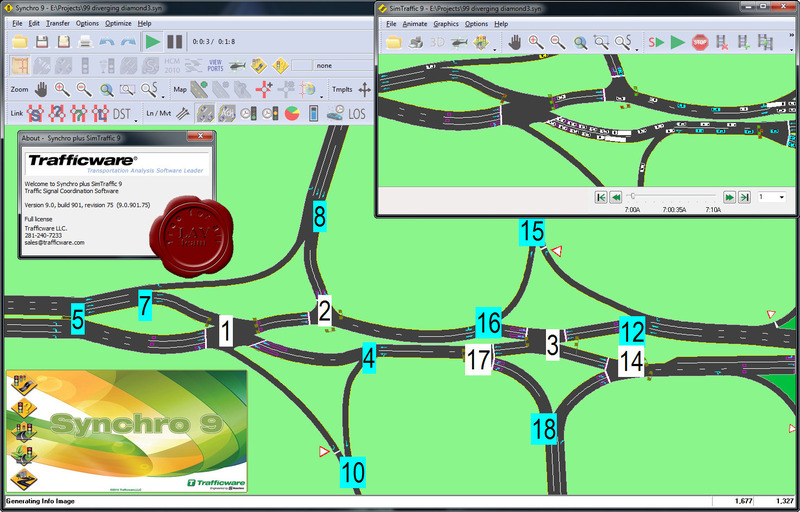 The package combines the modeling capabilities of Synchro and the micro-simulation and animation capabilities of SimTraffic with three-dimensional viewer to create the ultimate tool kit for any traffic engineer. Synchro is a macroscopic analysis and optimization software application. Synchro supports the Highway Capacity Manual’s methodology (2000 & 2010 methods) for signalized intersections and roundabouts. Synchro also implements the Intersection Capacity Utilization method for determining intersection capacity. Synchro’s signal optimization routine allows user to weight specific phases, thus providing users more options when developing signal timing plans. Because the software is easy to use, traffic engineers are modeling within days, thus adding to the number of reasons why Synchro remains the leading traffic analysis application. Using the 3D Viewer application within SimTraffic, users can automatically generate a three-dimensional view of any two-dimensional model. Use either the supplied models in the viewer’s library or add your own .3ds models to customize your scene. It is as close to reality as you can get without standing in the middle of an intersection. TripGen originally developed by Microtrans, is a simple, easy-to-use tool that calculates trip generation based on version 9 of the Institution of Transportation Engineer’s Trip Generation Manual. The analyst can select the desired independent variable and then calculate driveway volumes by using the rates or equations found in the Trip Generation Manual. Pass-by trips and internal capture trips for mixed-use developments (NCHRP 684) can also be taken into account. The software allows users to enter custom trip rates based on local or regional studies. Several reports are available for users to quickly review calculations. Future versions of the software will be integrated with Synchro, thus significantly reducing the time required to analyze traffic impacts.